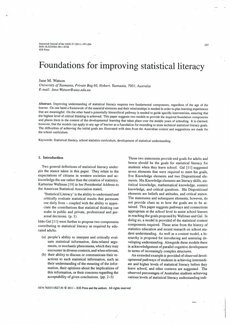 Improving understanding of statistical literacy requires two fundamental components, regardless of the age of the learner. On one hand a framework of the essential elements and their relationships is needed in order to plan learning experiences that are meaningful. On the other hand a potentially hierarchical pathway is needed to guide specific interventions, ensuring that the highest level of critical thinking is achieved. This paper suggests two models to provide the required foundation components and places them in the context of the developmental learning that takes place over the middle years of schooling. It is claimed, however, that the models can apply to any age of learner as a foundation for extending to more technical statistical literacy goals. The difficulties of achieving the initial goals are illustrated with data from the Australian context and suggestions are made for the school curriculum.